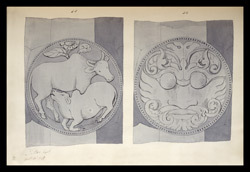 Pen and ink drawing of two sculptured posts from the railing of the Mahabodhi Temple at Bodhgaya, Markham Kittoe (1808-1853), from an album of 44 drawings (24 folios) of sculpture on the stupa rail at Bodhgaya (Bihar), made by Kittoe during his investigation of the site, January 1847. Cover inscribed: 'Kittoe's Drawings. vol. 2. The Buddhagaya Rail.' Drawings inscribed: 'M. Kittoe. Capt. '; also with dates varying from 11 to 19 January 1847.